In March of 2005, I made a little road trip down to San Diego with my son, Jeff... who was 19 years old at the time and was completing his general education college coursework at our local community college. 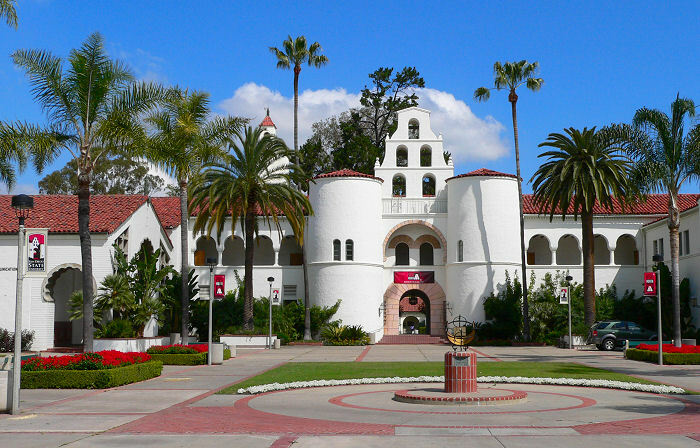 Jeff was seriously considering transferring to San Diego State University, and wanted to take a first hand look before finalizing his decision. As Jeff's interests lie in broadcasting, and he was already working at our local NBC TV affiliate at the time... we not only wanted to get a look around San Diego and the university campus, but also wanted to get a good look at San Diego's NBC TV affiliate as well as the TV station which is located on the SDSU campus. We stayed at a nice hotel on Shelter Island, on San Diego Bay. 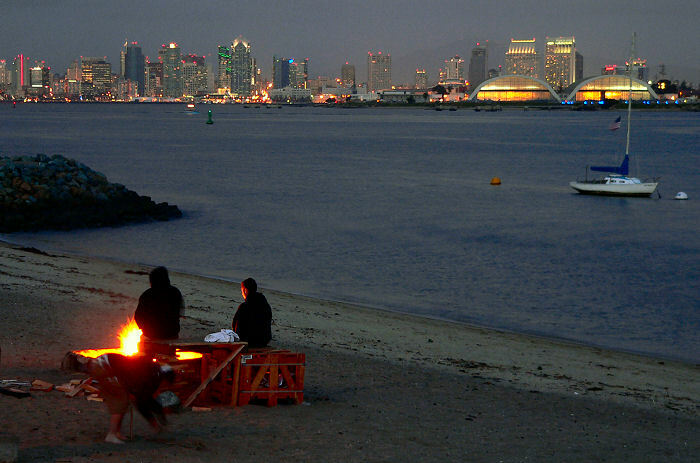 I took this shot of the San Diego skyline at dusk, from the beach next to our hotel. 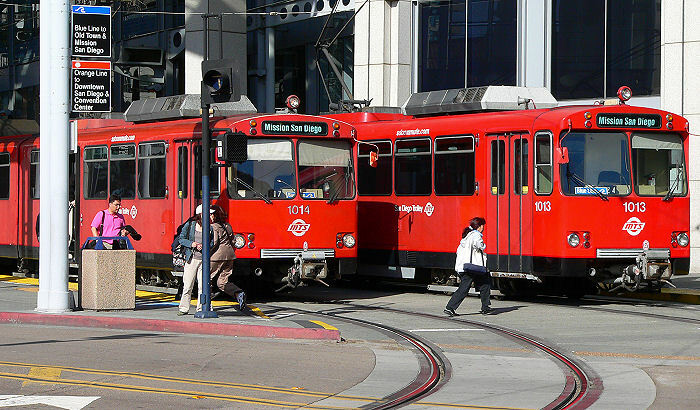 I was impressed by the trolley system that runs throughout the city. This might be very convenient for Jeff, as there are stations at the university and downtown at the TV station. 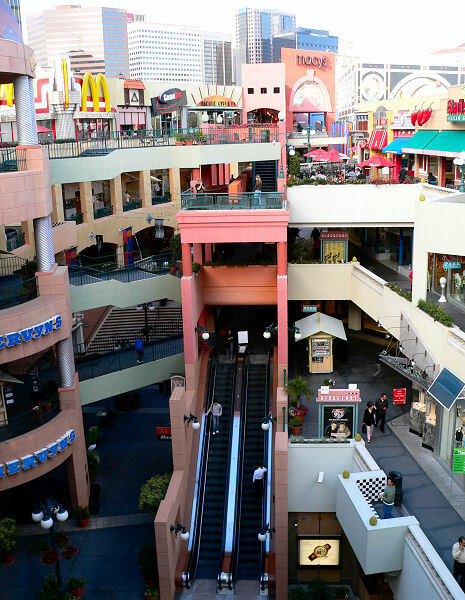 This is Horton Plaza, a prominent downtown shopping center that tourists love to visit. and is located right next door to Horton Plaza in the center of downtown. 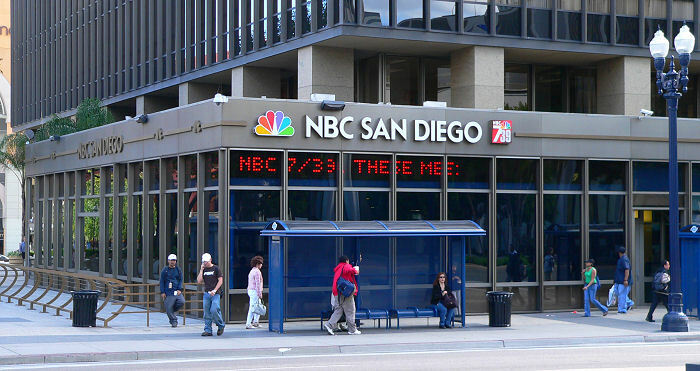 The call letters are KNSD, but they call themselves NBC 7/39 or NBC San Diego. 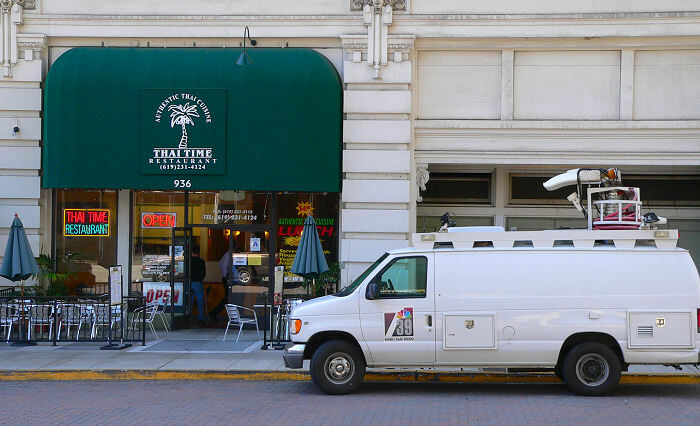 Because of their central location, they can just step outside the studio door to do a live report "from downtown". 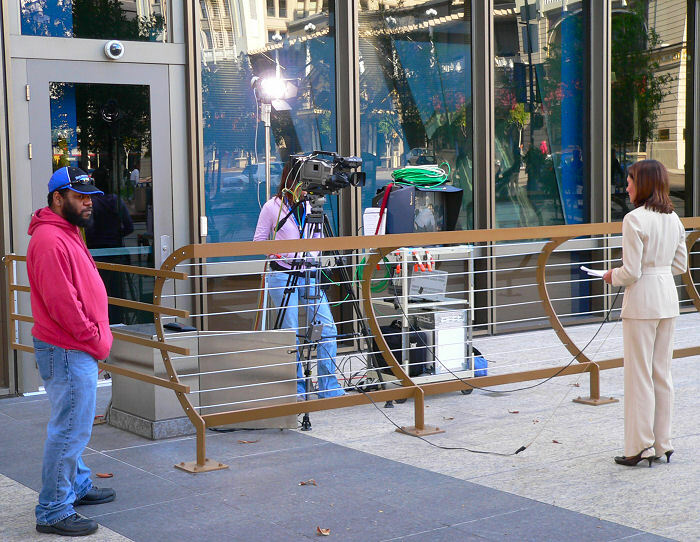 Here's reporter Catherine Garcia preparing for a live shot on the 4PM news. The guy on the left will scare away anybody that tries to interfere while they're live on the air. The 4:30 news team inside the studio, just on the other side of the glass in that last picture. The cameras are literally inches away from the news desk. I was impressed with how friendly everyone was, and how they all seemed to be enjoying themselves. 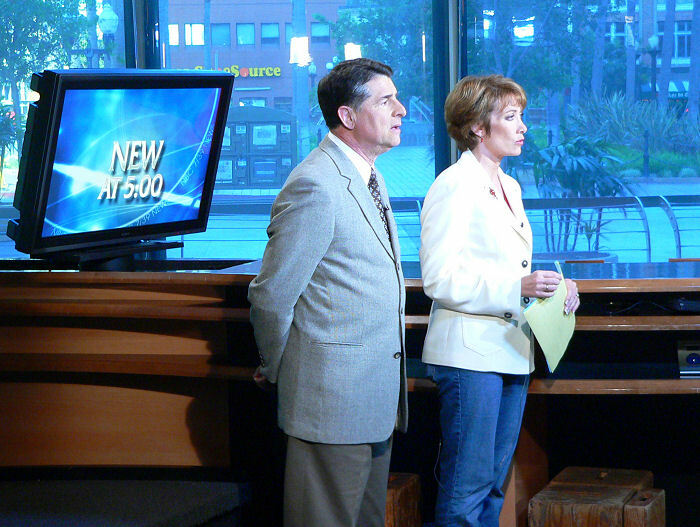 In another part of the studio, the 5:00 news anchors promote what's coming up in the next hour. On TV, they frame the shots so that nobody will know that the female anchor is wearing blue jeans! 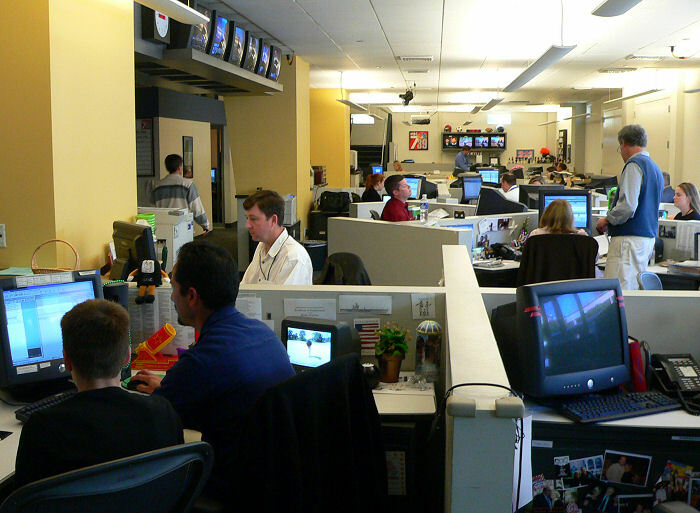 This is the newsroom, full of all the people "behind the scenes". On the left, Jeff looks over the "rundown" for the 4:30 news with the show's director, Paul Ferreira. The rundown is a second-by-second plan of all of the technical details of the show. Jeff and Paul had been introduced by someone who used to work with Paul in San Diego, but now works with Jeff in San Luis Obispo. Paul and Jeff spent about three hours together, and it was so gratifying to me to see that they spoke as two directors, not as director-to-college-student or director-to-major-market-wannabe. 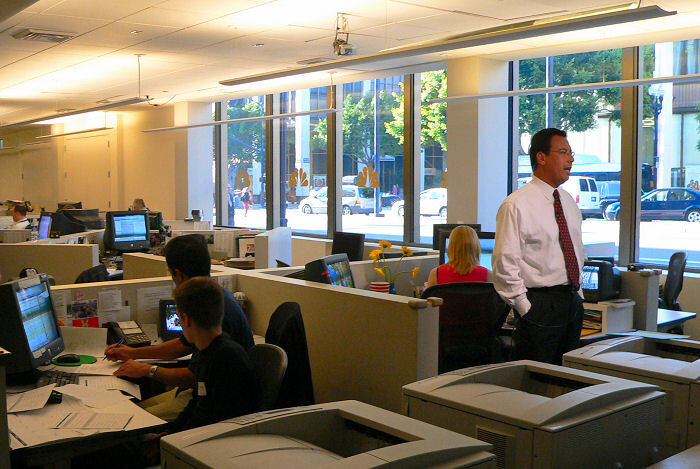 At the next cubicle, in the white shirt, is the producer of the 4:30 news. 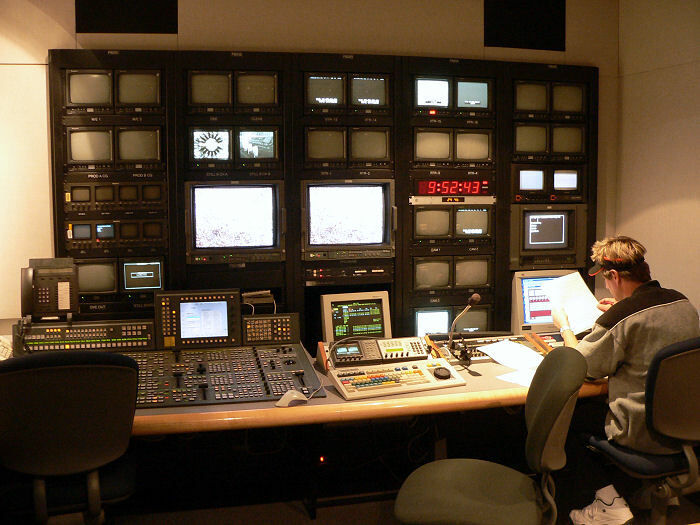 The director is in charge of the technical details, the producer is in charge of the journalistic details. There are individual producer/director teams for each half hour segment of the evening's newscasts. The guy in the center of the room, in the red shirt, is the executive producer... he is in charge of all of the evening's newscasts. This room is really the heart of the station's news operation. To promote what will be coming up later on the 4:30 news, anchorman Vic Salazar does a live report "from the newsroom". As he speaks live on the air, Jeff and Paul, are working off-camera just a few feet away. Notice the newsroom looks out on Broadway in downtown San Diego. Another thing to notice is those three big Hewlett Packard laser printers in the foreground. They are used to print out the scripts for the newscasts. One has blue paper in it, for the male anchor's script. One has yellow paper in it, for the female anchor's script. The third has white paper in it, for the script used by the production staff. Here's Paul directing the 4:30 news. He literally "calls out the shots" and the other members of the control room team push all the buttons. 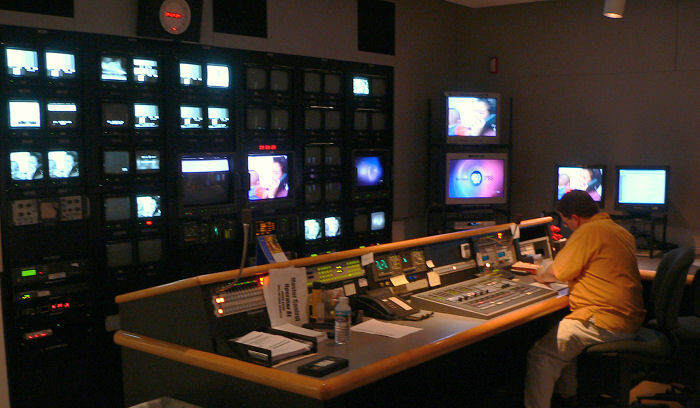 For example, the technical director at the right pushes the buttons on the video switcher as Paul tells him which video source to put on the air. The funny thing is that when Jeff directs the news at KSBY, he does by himself what they use four guys to do at this station! I was also impressed by the five flat-panel plasma monitors they use here, in place of what would be 40 individual CRT monitors at most stations. Jeff likes Thai food, so we were amused to see a Thai restaurant right across the street from the TV station! He had lunch there, but decided that his favorite Thai restaurant back home is better. 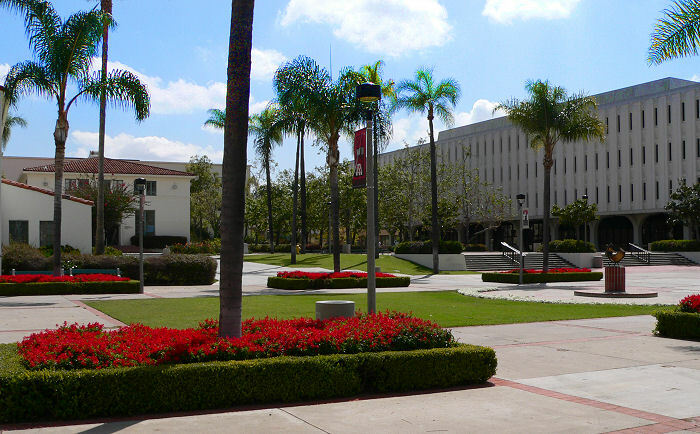 Besides touring downtown San Diego and the NBC owned-and-operated TV station, we also spent quite a bit of time touring the campus of San Diego State University. The grounds are beautiful, and the campus is a real feast for the eyes. Everywhere you look on campus is another beautiful scene. The weather was also absolutely perfect. 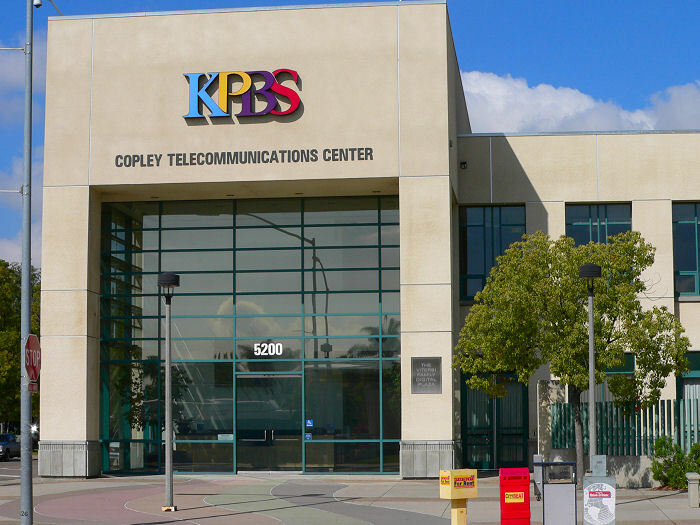 The university owns and operates the local public broadcasting TV station, KPBS. Even though we had made no advanced arrangements, we were able to get in contact with someone at the last minute who gave us a great impromptu tour of the station. 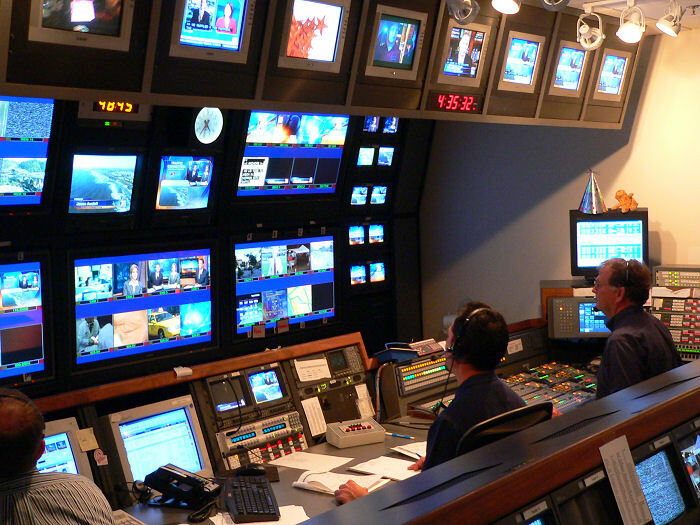 One of the production control rooms at KPBS. They have really nice equipment... better than what Jeff is used to using at KSBY, but not as nice as at the NBC owned-and-operated station downtown! The master control room at KPBS. Click here to find out more about Jeff and his interest in broadcasting. 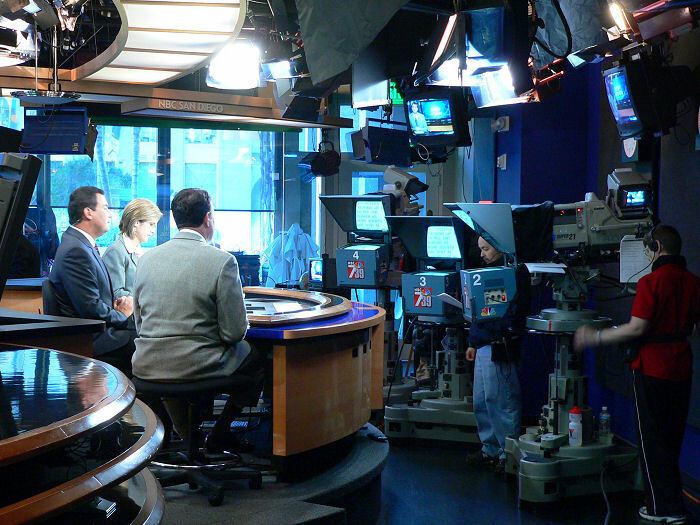 By the way, Jeff did eventually transfer to SDSU and did indeed get a job at San Diego's NBC TV affiliate! Jeff has his own web site, where you can read about his interests from his point of view.